I am finding my eye is drawn more and more towards black and white for landscapes, particularly when the rolling hills and mist are composed of such subtle tones. Well done Mike. Really like the range of tones in this image. Thanks, Ken. This is actually an HDR fusion of 3 exposures, which was necessary because even at this time in the morning, the Australian sun is quite harsh. It’s something I am finding quite a challenge after living all my life in the northern hemisphere. Gosh, thanks Andy. I’ve admired your black and white work for a while! I concur with Ken; additionally, I really like the detail in darker tones. Great capture. Congratulations. Stunning composition Mike – I think this works so beautifully. 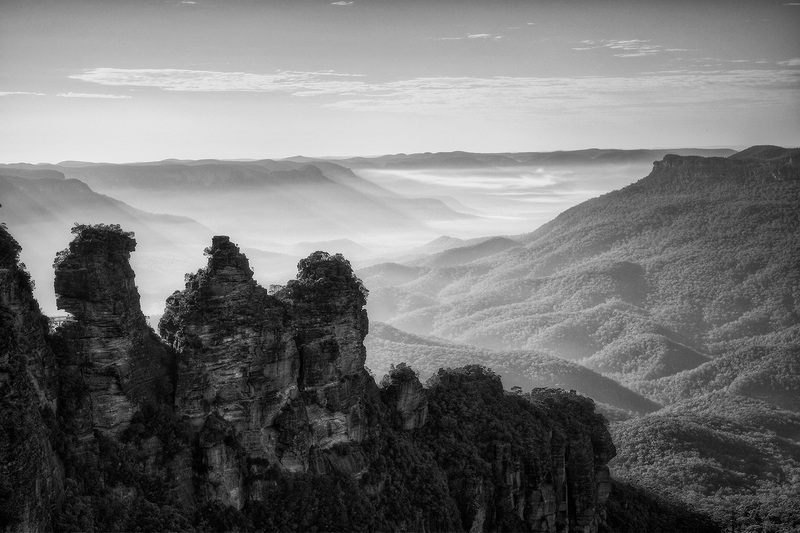 You don’t often see the Three Sisters in B&W and by doing it early morning you’ve created that terrific tonal range that others have said. Fantastic; I love it! Good clarity in the picture! Black and white works well for it. Hey… one heck of a photo!!!! I feel ya with b/w and I always try to find the one that works. Yours has depth and cries for a second and third look when viewed. This pic is not easily dismissed…. I belong to a rather large photo club and we discuss compositions that work and ones that don’t all the time. You should feel very proud to have the expertise to bring this piece of the world to light. Major kudos!!!!!! Thanks, Mike. This is the first photograph that I’ve been truly happy with for about a year. I was beginning to feel I’d lost my mojo. Having the time to think through what I was doing and savour the experience was an important part of the process, and I am lucky enough to have the encouragement to make time available for my photography again. I am looking forward to some early morning trips to the coast, soon. The only problem is that there is so much coast in Australia, it’s hard to know where to start. A nice problem to have. Goodness gracious!! this picture is magnificent!! wooww!! Wonderful tones and excellent contrast. Mike, this is a magnificent picture. This is the Blue Mountains in NSW, right? I visited there in 2001. The contrast is just right for the image. I can see why you went for a HDR but had you not said so I wouldn’t have noticed (which is the way a HDR shot should look like). Thanks! Yes, it the Blue Mountains in NSW. I think I’ll be revisiting this spot many times. It’s one of those places that you need to get to know, in order to make good photographs, I think. Beautiful image. Love the delicate layered effect created by the mist. Thanks, Stevie. Depending on the time of year, mist can be all you see when you get up the mountains. Thanks. The scale of the landscape here is amazing – I hope I managed to convey that. This is a beautiful image, I love the way your eye is drawn all the way to the horizon. I love the Blue Mountains, especially since they’re not far from where I live. I just discovered your blog and I really like your work, I can’t wait to see more! that is such a great shot.